Thinking about installing artificial grass in your garden? It’s not surprising considering how easy it is to install and how low maintenance artificial turf can be. However, you might be concerned that you’ll still have to go around the garden, utilising the weed killer to prevent those pesky, unsightly greens growing through. Luckily, there are a few installation methods that you can implement to dramatically reduce the risk of weeds and even prevent them from growing through entirely. What's more, they won’t add too much extra cost to your garden. Why would you want to ditch the weed killer? While all herbicides and pesticides have been rigorously tested to ensure safe use throughout the UK, weed killers are still made up of harsh chemicals that can have adverse effects on other insects and plant life you may find in the garden. They can also run off into waterways which can lead to further issues for any plant life or animals that live there. In fact, one of the most popular chemicals found in common household weed killers has recently been linked to the recent decline in honeybee numbers. Should you already have artificial grass installed in your garden and you’re suffering from weed growth, we’ll provide some helpful tips later on in the post to prevent the need to bring out the heavy-duty weed killers. So you’ve decided to install artificial grass in your garden and you are preparing the area for the turf to be laid. In order to reduce and prevent weeds and unwanted plant life growing through, there are a couple of extra layers you can add. Sand Layer – Also good for levelling off sloped areas. Lay down a layer of sand and this will help to prevent any seeds that do happen to blow across your artificial grass from rooting down into the dirt and becoming harder to remove. Sand will also make it difficult for any existing seeds or plant life in the underlying soil to grow through. 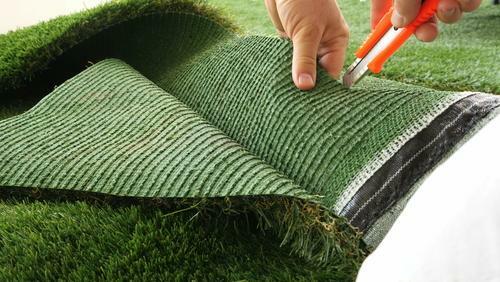 Weed Membrane – While the sand layer can be skipped, you will definitely need to use a weed membrane for artificial grass. 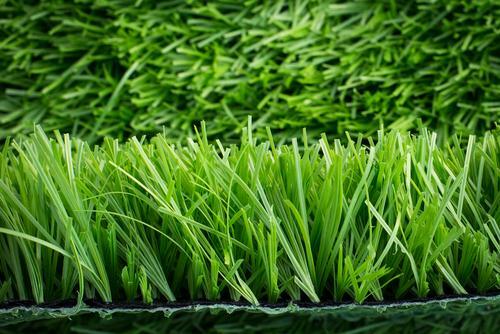 These membranes are specifically designed to lay under your artificial grass and allow sufficient water drainage - while preventing seeds from rooting down or existing weed shoots to grow up through your fake turf. The heavily woven cloths are designed for long-time usage, so you won’t need to worry about rotting or regular replacement. Problem Areas – Places in your garden that experience more shade will likely have more moisture retention and are going to suffer increased growth. If you aren’t planning on using a base across your whole garden, consider removing the topsoil layer here and replacing with sand, in addition to a weed membrane to prevent recurrent weed growth. After installation, you may notice weeds growing around the edges and seams of your artificial garden – these areas can be treated with some homemade alternatives we’ve mentioned below as opposed to harsh weed killers. After you’ve had your artificial lawn installed, you may still notice weeds appearing on the surface. Most of the time, these are surface-rooted seeds and can be simply brushed away during general maintenance. Unfortunately, these types of seeds are often carried on the wind and it can be hard to prevent them getting into your garden. Consider cutting back overhanging trees and bushes and keep these neatly trimmed so they don’t grow back to cover your artificial garden. This will offer some reduction in the number of shoots that appear. During general maintenance, including brushing your artificial grass, you’ll want to ensure that all leaf litter and debris is removed. This helps prevent composting which can quickly accelerate the growth and anchoring of airborne seeds. This process also actively removes potential problem seeds from the surface of your artificial lawn, preventing rooting and growth. Bird waste is also comprised of a lot of seeds and quickly removing this (by washing down the affected area or scrubbing where necessary) will drastically reduce the chance of weed growth. If you find that there are still weeds growing through your artificial lawn despite regular maintenance, there are more natural alternatives that you can make at home to prevent weeds from growing back. These options may require a bit of work but can be easily used a couple of times a year or if you notice a particular problem patch. Boiling Water – Boiling water can be used to kill greenery popping up where it shouldn’t be and ensures roots can’t grow back. However, be warned – boiling water does destroy ALL plant-life so be VERY careful if using near to an area you have flowers, trees or bushes growing. You should, of course, always take care when using scalding water and take the proper precautions, wearing protective clothing, gloves and glasses where necessary. Home-Made Vinegar and Salt Mixture – Another fairly hard-core solution. There are plenty of home vinegar and salt solutions on the internet and they come recommended by home gardeners. However, this solution is another non-discriminate option and will kill the surface of any plant it comes into contact with. Additionally, using high amounts of salt and vinegar can be detrimental to your soil so consider very carefully if you want to cause long-term effects to your garden prior to use. This particular solution is best used on paved or concreted areas that have been covered with artificial grass. Blocking Sunlight to the Area – Even in the shaded areas of your garden, weeds need to absorb sunlight to grow and removing this sunlight can cause weeds to die off and prevent growth reoccurring. Consider adding permanent edging tiles, borders or similar around the perimeter of your artificial lawn. Alternatively, if you’ve got a couple of dry days, cover the affected area with cardboard or newspaper and allow the weeds to shrivel and perish. With careful installation and regular maintenance, you’ll be able to keep your artificial garden looking fresh and weed-free. If you are considering artificial grass for your garden, we hope this has helped you consider future preparations your garden may need to give it a good head-start.